Our compilation of statistcs we collected from the ABC's War On Waste series got a lot of attention, so we decided to put an infographic together to make some of the more important stats stand out a bit more. This infographic can be shared with friends so that they can also learn about the worrying state of rubbish in Australia. For more interesting statistics shared from the War on Waste, see our full list that we've collected from the episodes. Australians eat 5 million bananas a day, making it the number 1 selling supermarket product. A large percentage of bananas don’t reach the shelves. Go check these statistics out, along with some of the other information we gathered from the War on Waste series. Here at Same-Day Rubbish Removal, we help people every day in combating their own waste problems, and we can help you too. Call us now on 0402 737 046 for a free quote - we'd love to help you out! Let Same-Day Rubbish Removal Help You. By looking at these statistics, we reckon there’s a good chance that you have junk that needs to go. Don’t let it go to landfill, have Same-Day Rubbish Removal come and collect it and we’ll make sure it is disposed of responsibly, if possible, we’ll take it to the appropriate recycling centres across Sydney. We don’t want to keep it a secret – we wish all junk removal companies would do it – but having your junk recycled is part of the reason we can offer such a cheap waste disposal service. The other ways in which we manage to keep our costs to a minimum is our service is fast and all-in-one. Instead of having to do multiple trips to your location with a skip bin (drop off and pickup), our efficient workers come and quickly hand load your items into our truck and then get going again! We know all the shortcuts around Sydney, and we’ve got local teams ready to come to you. It doesn’t matter where you’re located in Sydney or what items you need to remove. It may be a bunch of coffee cups or old clothes, but more than likely you’ll need us for larger items like old fridges, couches, washing machines, etc. Whatever it is, we can take it away! Whether you’re located in Woollahra near Sydney's CBD, Mosman on the North Shore, or down in the Macarthur region, we can come to you fast. Give our friendly and experienced team a call now. You’ll be glad your place is free of junk, and it will give you a chance to work on ways of minimising waste in the future. 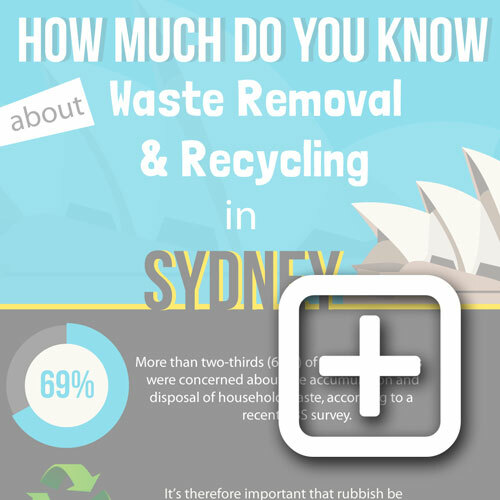 If you'd like to see more statistics about waste in Australia, click on the infographic link below for a few more numbers regarding Sydney & NSW.